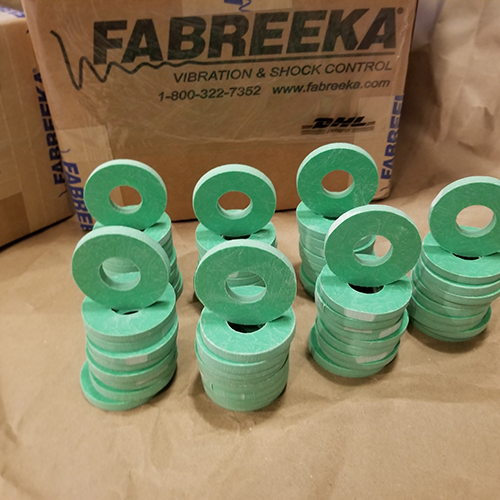 Depending upon the size and thickness, Fabreeka pad can ultimately withstand loads up to 12,000 psi. Normally, compression stresses are designed not to exceed 2,000 psi to extend service life and reduce permanent set. Fabreeka pad has a relatively high damping rate of 14% of critical, twice the value of damping for natural rubber and unreinforced elastomers. 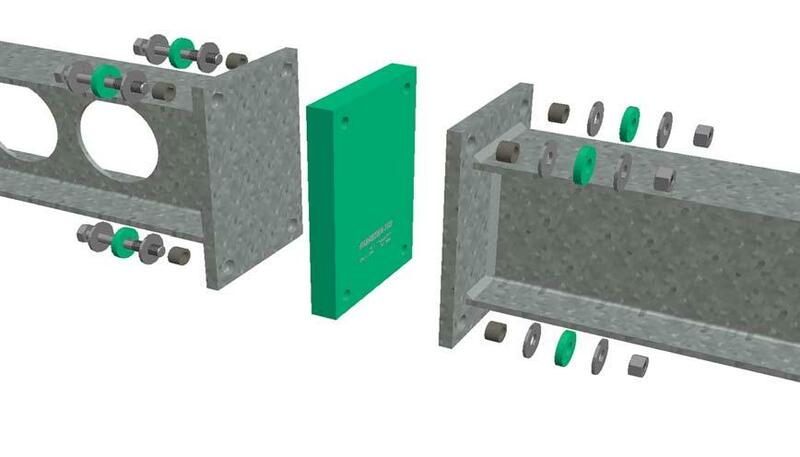 Fabreeka pad has very high energy storage per unit volume, which makes it ideal for shock isolation. Fabreeka pad is impervious to most oils & is resistant to the effects of steam, water, mildew & brine. The effective temperature range is -65°F to 200°F. The durometer of the Fabreeka pad is 90+/-5 (Shore A). Fabreeka-TIM® material is supplied in sheets or cut to size per customer drawings/specifications and is available in thicknesses of 1/4″, 1/2″ and 1″. It is also supplied as thermal break washers for the bolted connections between external and internal steelwork. 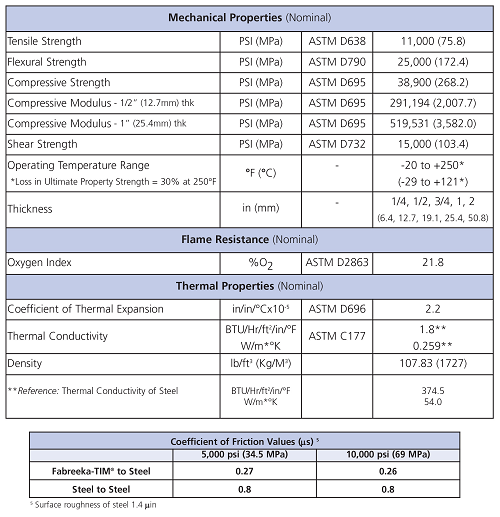 Please see our Fabreeka-TIM® catalog and design guide for mechanical and thermal properties. 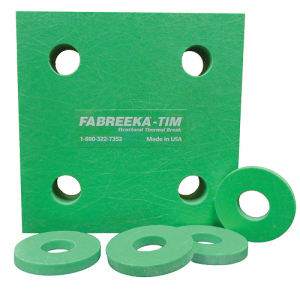 Fabreeka’s structural thermal break pad / connection, or thermal insulation material (Fabreeka-TIM®), is manufactured from a fiberglass-reinforced laminate composite. The properties of this material provide a thermally efficient, energy-saving product that prevents thermal bridging in structural connections. 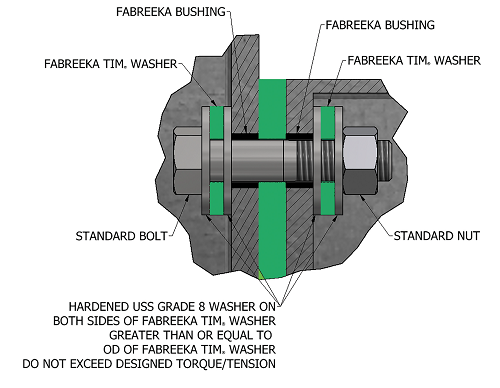 Fabreeka-TIM® is a load bearing “thermal break” used between flanged steel connections. The primary benefit is that it maintains structural integrity while reducing heat loss.